Deep in a barely lit cave in some unknown part of a strange country there’s a stone structure which contains the Dark Vortex; that’s also the name of this online slot from Yggdrasil Gaming which offers players some clever features and the chance to buy straight into the bonus game. 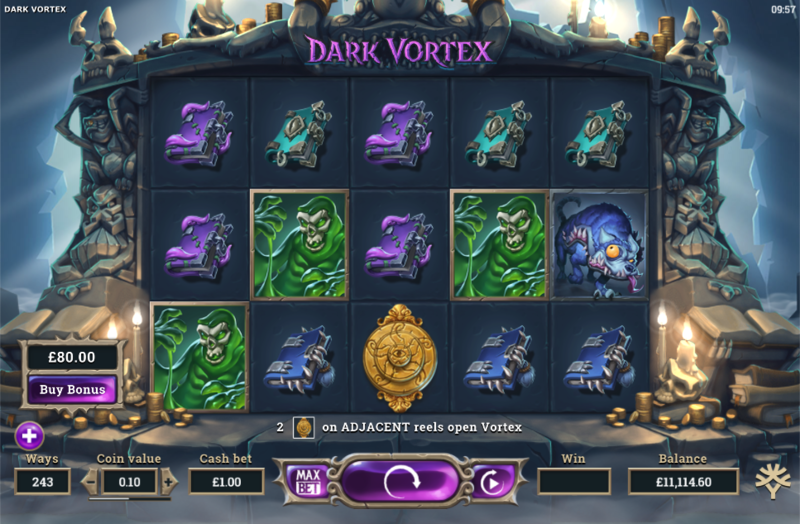 Dark Vortex is a five reel slot with five rows and 243 ways to win; the edifice on which those reels spin has various monsters carved into it and is covered with flickering candles and gold coins. The high value symbols are monsters of varying colours – red, purple, green, light blue and dark blue; five creepy books of similar colours represent the lower values. Wins can be formed from right to left as well as left to right. 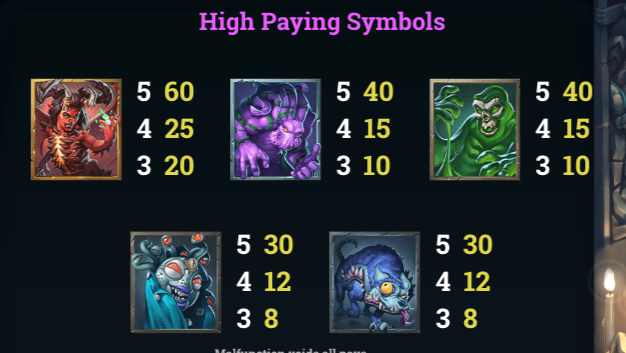 The wild is a big, gold ‘Wild’ which only appears within the features; it will replace all other symbols to help form winning matches except for the Vortex and Orb icons. This is triggered by landing two of the Vortex symbols on adjacent reels; those two reels become Vortex Reels with more ways to win, more wilds, high value symbols and orbs. You’ll also receive three free spins to try and land more Vortex symbols adjacent to the ones already there – each time this is accomplished two more spins are awarded. Pink and blue orbs are collected to the left and right of the reels. If you’ve managed to transform all reels into Vortex reels the free spins are awarded with the collected orbs – pink ones are the number of stacked wilds earned while blue ones determine the number of free spins. If you’d like to dive straight into the bonus feature it can be purchased for 80x your total stake and you’ll get to pick from the items displayed to determine the number of stacked wilds and free spins. Dark Vortex is an immensely detailed slot with some lovely graphics but the gameplay is what it’s all about – the Vortex feature is very inventive and triggers often enough to keep things interesting. The base game RTP is 96.50% but it increases to 97.00% when using the Buy Bonus option.